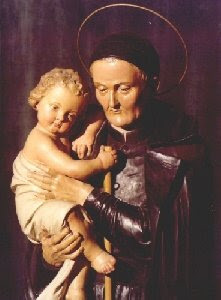 St Bernardino Realino, born of noble birth in Capri, Italy studied medicine initially but changed to law. At 26, he became Mayor of Felizzano, a position that included judge as well. The people found him an honest judge and one who attended daily Mass. When he was 32, he wrote to his brother “I have no desire for the honours of this world, but solely for the glory of God and the salvation of my soul”. He saw himself as an instrument of Divine Providence and thought nothing of giving his entire salary to the poor. His reputation as a competent magistrate preceded him and he was appointed to top jobs. However, he was attracted by the Jesuit order and following an 8-day retreat, during which time he had a vision of our Lady, who commanded him to enter the Society, he became a Jesuit in 1564. In humility he asked to be a brother, but his superiors instructed him to go on to the priesthood. After taking his three vows in 1566, he was unexpectedly told to prepare for ordination, which he received in 1567. Though he had been a Jesuit for only 3 years, Fr General Francis Borgia appointed him master of novices in Naples. As a priest, he preached and catechized, visited slaves on the galleys in Naples harbour and sat long hours in the confessional. The direction of souls was Fr Realino’s special charism.In 1574, he was sent to Lecce in Apulia to set up a Jesuit house and college . He stayed for 42 years. He and Lecce were inseparable because several times when his provincial and the general wanted to move him to Naples or Rome, something serious would happen to prevent him leaving, e.g., a high fever that required a period of rest or a severe thunderstorm. This led his superiors to conclude that it was God’s will that he remain in Lecce. Until his final illness in 1616, he continued to give himself generously to all who sought his counsel and the lines leading to his confessional grew ever longer. Princes and prelates were among the simple folk awaiting their turn to speak with the ‘holy old man’. When the Lecceans heard that Fr Realino was dying, crowds gathered outside the Jesuit College and only men were allowed in to kiss his hand and devoutly touch religious objects to his body. On his death-bed, the city mayor and magistrates formally requested Fr Realino to be Lecce’s defender and protector in heaven. Unable to speak, he nodded.Fr Realino who gave up a successful career as a lawyer and spent most of his Jesuit life as a humble parish priest died at 86, with his eyes fixed on the crucifix, and his final words were, “O Madonna, mia santissima (O Lady, my most holy lady). He was beatified by Pope Leo XIII on September 27, 1895 and was canonized by Pope Pius XII on June 22, 1947.